The focus of Lower School programs for K3, K4, and K5 is to give your child the best possible beginning. Through personal attention from caring faculty and a thoughtful academic curriculum, we develop your child’s physical and mental abilities. 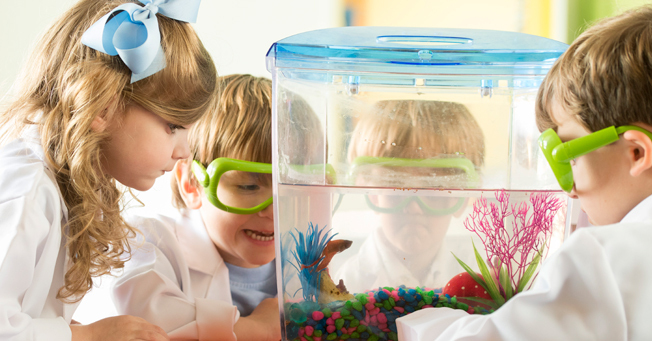 Engaging and imaginative, our programs accelerate learning by cultivating a student’s natural curiosity. We incorporate visual, auditory, and tactile experiences to help young students gain a deeper understanding of the world around them. By focusing on what really matters, we help build open hearts and minds. The academic curriculum covers reading, writing, listening, motor skills, and exploring, as well as art, music, and library. Each day starts with a Bible story, the Pledge of Allegiance, and prayer. Mind and Motor physical education channels children’s natural energy into the refinement of their perception and coordination abilities. Teachers integrate iPad games for K4 and K5 so students can practice concepts of shapes, letters, counting, colors, and more. Tea Party break time each day allows for snacks and socializing. Cooking activities create a fun and tasty way to try out reading and math skills. Spanish vocabulary and culture lessons expose children to the idea of language and global diversity. Annual traditions such as our Christmas music programs, Mr. McGregor’s Garden Tea Party, career day, and the Easter egg hunt are eagerly anticipated times to celebrate and show off progress to proud parents. Lunch Bunch and After School programs provide extended care options that allow your child to sample activities, arts, and music. Most K3, K4 and K5 teachers are certified in early-childhood or elementary education, and several hold master’s degrees. Kindergartners move on to the first grade feeling safe and secure as part of the JA community. The academic exploration and play from their kindergarten years instill in children the foundation for a lifelong love of learning. JA’s kindergarten is dedicated to providing a caring and loving atmosphere. Each teacher strives to ensure daily opportunities for mental, emotional, spiritual, social, and physical growth. Our kindergarten gives students an excellent start in reading, writing, listening, and speaking. They explore and expand their knowledge of the world, all enhanced by an outstanding introduction to art, music, and library. Another program, Mind and Motor, focuses on developing the children’s perceptual motor skills, strengthening the link between moving and learning by giving them numerous opportunities to deal with concepts of space, shape, abstract thought, and problem-solving. Schedule your in-person tour of Jackson Academy’s K3, K4 and K5 to learn more about JA and decide if it’s a good fit for your child, by contacting admission@jacksonacademy.org or call 601.364.5721. If you are ready to begin the application process, click here.